In 1975, while studying drawing and painting at the Art Students League and sculpture at the New School, I decided to portray what I was saw in a new way. 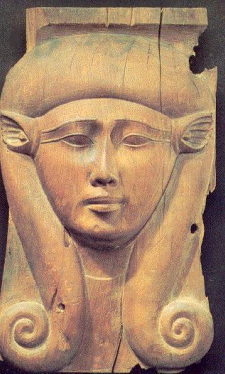 After about a year of false starts, I began reading up on the physiology of vision at Flower 5th Avenue hospital library and was attracted to Egyptian reliefs at the Met. I realized It might be possible to create visual illusions in a shallow three dimensional space. One day I decided to do a still life of pears on a plate. Instead of painting on the front of the canvas, I pressed some sculpture clay into the back of the stretched canvas, forming a tablet. I sketched the outlines of the pears and the plate on the clay with my brush handle and then built up the pear forms with more clay. For the cast shadows, I instinctively hollowed out the clay. The light from the north windows of my 7th Street studio lit up the pears and created real shadows in the hollows. I was stunned by the concept of working directly with light and shadow on a relief surface. I had fallen through two dimensions into a new realm. I have been exploring this realm ever since, marking trail with my reliefs, now numbering over 1,200 original pieces and many more editions. I have learned a new way of seeing, and by necessity have invented new materials, easels, tools and methods of working. After 40 years, I have barely scratched the surface. 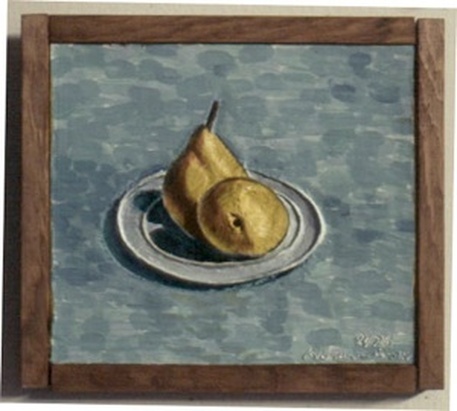 First Relief 1975-01 Pears Acrylic on clay 8.5"x9.5"x1"
Here are photos of my 7th Street NYC studio, my 649 Mai Street Brewster, MA studio, my 1772 Main Street, Brewster studio, tool, materials, etc.